Bernie Sanders Could Win Iowa. Here Are Two Reasons Why. The insurgent Democrat has raised millions through small donations—and turned out huge crowds. Williamsburg, Iowa—For the rural communities of Williamsburg, Conroy, Parnell, and the English Valleys in east central Iowa, the weekly Journal Tribune newspaper is the media. Not all of the media in this cable and digital age, but a vital part of it. This is where the people of Iowa County, Iowa, get the high-school football scores, reports on the upcoming state show-choir fest, and details of where they will caucus on Monday night. That statement, published Thursday in weekly papers across Iowa (where Sanders is advertising and the other candidates for the most part are not), is no longer precisely accurate. The “2.5 million small contributions” number is now outdated. By the final weekend before Monday’s first-in-the-nation Iowa caucuses, the Sanders campaign had attracted more than 3 million donations. “When we started this campaign, no one gave us a chance. Together, we proved that when Americans stand together, we could raise enough money to take on the billionaire class,” says Sanders campaign manager Jeff Weaver in a message to supporters. The millions of contributions—averaging roughly $27—have given the Vermont senator’s insurgent campaign the resources that are necessary to stay in the running with the campaign of front-runner Hillary Clinton in Iowa. Clinton certainly has raised more money overall, but Sanders has held his own; in the final quarter of 2015, while Clinton took in $37 million, Sanders collected $33 million. Money isn’t everything in politics. But when a campaign is reasonably competitive in fundraising, as the Sanders campaign has been in recent months, it can be competitive in the high-profile and highly expensive early states of a presidential race. In a contest where candidates are throwing everything into the final push—physically and financially—the ability of the crowdfunded Sanders campaign to keep pace is one of the striking stories of the 2016 race. Yet what is notable is not just the way the Sanders money is being raised, not just the amount that has been collected and not just the amount that is being spent. How the money is being spent also matters and, as with so many aspects of this year’s race, the Sanders camp is making unexpected moves. The Democratic candidates are both running plenty of television ads in Iowa (as of early last week, NBC News was reporting that the Clinton team had spent almost $9.5 million on TV commercials, while Sanders had spent almost $7.5 million). They’re good ads, generally positive and appealing—with both Clinton and Sanders sounding progressive themes that appeal to the activists who attend caucuses. But the ads for the Democratic candidates are part of a cacophony; they appear around the clock in the same slurry of campaign commercials with the attack ads aired by the various and sundry Republican contenders and the Super PACs that promise they are telling “the truth” about them. The Democratic campaigns are pouring funds into phone banks, direct-mail advertising, and all the other tools of contemporary “ground game” in Iowa. There’s lots of talk of tech-savvy interventions and new tools of reaching and tracking supporters. But Sanders is also spending a lot of money on old-school tools and tactics, like those advertisements in rural weekly and daily newspapers. Doug Burns, the co-owner of west-central Iowa’s Carroll Daily Times Herald told The Washington Post that Sanders has “utilized advertising in weekly newspapers in a way I’ve never seen in my career.” And the Sanders camp began running these newspaper ads not on the eve of the caucuses but last fall. Another old-school tool Sanders has utilized for months is the mass rally. Iowa has in recent years been seen primarily as a state where candidates spend time with individual voters or small groups, but the Sanders camp changed the calculus, pouring resources into organizing large rallies across the state through the fall and winter and right up to the cusp of the caucuses—when huge rallies were held in Dubuque, Cedar Rapids, Iowa City, and Des Moines. As the final push began, the Sanders campaign announced that 62,866 people had turned out for rallies and town meetings in Iowa over the months of campaigning by the Vermont senator. 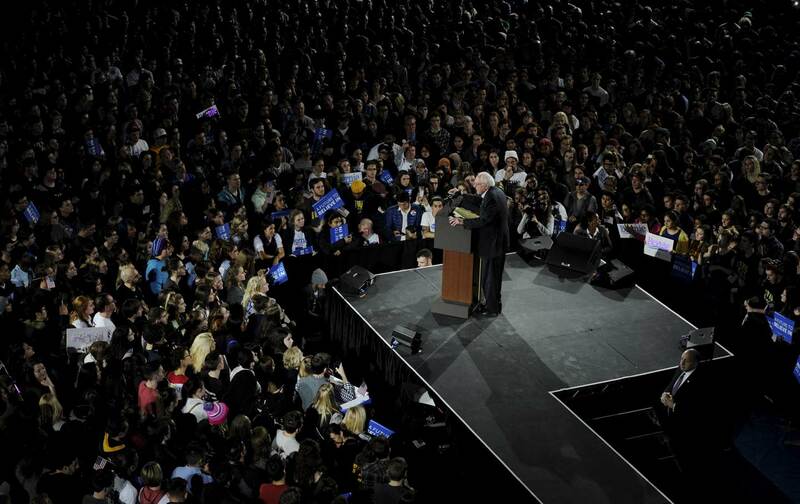 By caucus night, the figure was certain to be over 70,000. The message Sanders delivered at those final rallies across Iowa, in large cities and small towns, blended the populist rhetoric that have animated his campaign with talk of the populist fundraising that has made the campaign possible.